Two sets of improvised music this week from a trio put together by guitarist Daniel Thompson. Daniel is a prolific improviser, extremely active on the London free scene, and organises the monthly Foley Street improvised music concert series at the King and Queen pub in the West End. 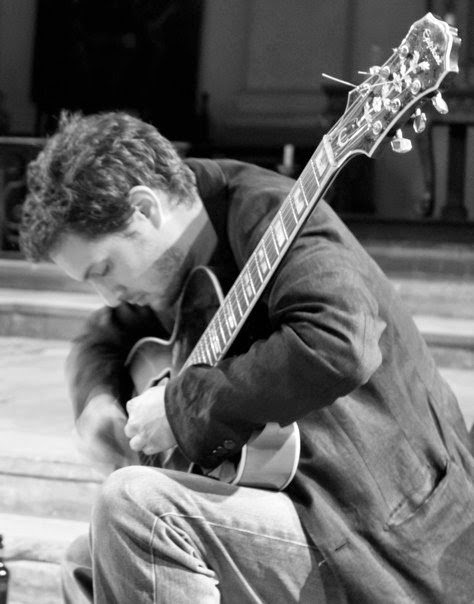 Originally from Norfolk and largely self-taught on the guitar, Daniel moved to London in 2006 and studied with the guitarist and Mopomoso co-founder John Russell. He has performed/collaborated with numerous improvisers including Guillaume Viltard, Neil Metcalfe, Adam Bohman, Terry Day, Simon Rose, Ricardo Tejero, Steve Noble, Alex Ward, Phil Durrant, Kay Grant, Benedict Taylor, Roland Ramanan, Mark Sanders, Anton Mobin, Tom Jackson, Javier Carmona and Julie Kjaer amongst many others. The trio performing for us this week has been assembled especially for this gig, and we’re looking forward to some great music! This entry was posted in drums, guitars, improv, joy, magic, trombones on October 17, 2014 by cath.